Mosquitoes spread a disease called dengue fever. Dengue fever may be more than three times more prevalent than current estimates, according to a new report. 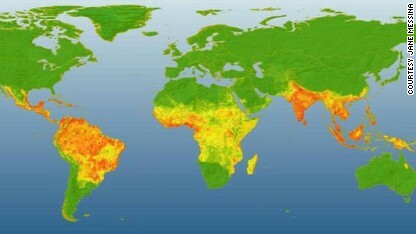 The study, led by researchers at the University of Oxford in England, estimates there are 390 million dengue infections around the world each year. Currently, the World Health Organization puts the number between 50 and 100 million infections each year. Researchers hope their findings will help pinpoint parts of the world most vulnerable to dengue fever and develop strategies to treat it. Dengue fever is passed from person to person by mosquitos. Unlike malaria, there are no drugs you can take to avoid getting it. It also is difficult to treat and thus far, attempts to develop a vaccine have been unsuccessful. Map: Areas in red indicate high risk for dengue occurrence, while green areas indicate low risk. It is most common in Asia and India, but more cases have been popping up in the Caribbean and Latin America in recent years. In mild cases, dengue fever causes a high fever, rash and joint and muscle pain. In extreme cases, it can cause death. According to the World Health Organization, about 12,000 people die of dengue fever each year. Many of them are children. For this research, a team of international experts developed a statistical model based on things like temperature, humidity and even newspaper reports, to figure out where dengue was most likely to show up. Then, they combined that information to develop a map, down to precise 5-by-5 kilometer regions where outbreaks were most likely to occur. "This helps us make a decision on where we prioritize efforts to reduce the burden of disease," says Tom Scott, a researcher at the University of California, Davis, and one of the authors of the report. 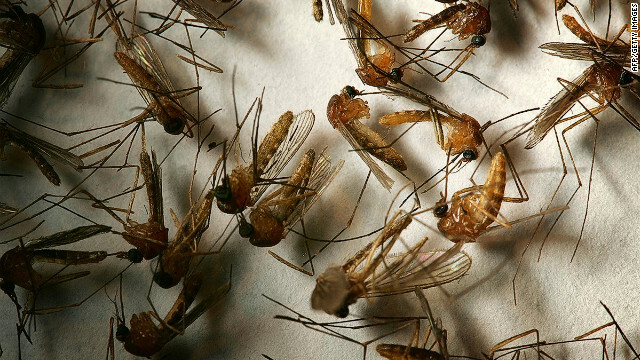 By 2015, the WHO wants to reduce deaths from dengue fever by 50%. "It's really doable," says Scott. "These maps could help direct that." But some experts take issue with the study's numbers and say the estimate is too high. "Dengue is extremely complicated," says Dr. Scott Halstead, who has been studying the disease for over 50 years and is the senior scientific advisor to the Dengue Vaccine initiative at the Bill & Melinda Gates Foundation. He points out the numbers for Africa. "A disease resistance gene in Africa has been well established, which suggests the disease burden in Africa is overestimated," says Halstead. The study is published in the current edition of the journal Nature. I gotta love the idiot doctor who blows off dengue, citing African disease resistance. It's that very resistance that should be alarming people, as disease resistance wouldn't have shown up where the disease originated if-at one point- it hadn't largely killed off those who lack such resistance. I read somewhere that when the common cold first appeared, it killed off half the people who got sick. lovely new antibiotic-resistant infectious friends inadvertantly carried along on the skin, hair, clothing, or equipment. Now, that's I'm no doctor, but if I was-that's what would worry me. "disease resistance wouldn't have shown up where the disease originated if-at one point- it hadn't largely killed off those who lack such resistance. " Well, no. Evolution works through differential reproductive success. If you carry a gene that protects you from a disease that otherwise weakens you or impairs you in some what that you have less children, that gene will inevitably become more prominent in the population. The disease doesn't have to kill anyone off – it just has to put those who have the disease at some reproductive disadvantage relative to those who have some sort of protection. Overall, those with the disease can and normally do live full lives; as a group, however, they tend to have fewer offspring. "I read somewhere that when the common cold first appeared, it killed off half the people who got sick." You should find another site to read. The origins of the common cold are long lost; we really have no idea how it came to be, although modern biological theory would reiterate what I said above. Also, according to your original theory, if this were true and the cold began as a killer virus, we would all be immune by now, which is clearly not the case. Dengue is a problem which may take an alternative action to solve. Thinking out of the box may produce better solutions. YES the Hulda Clark zapper does get rid of Dengue!!! the 30khz setting. i used it with 10 different people and all reported getting better right after use. I did 7 minutes on the break for 7 minutes then 7 minutes on 7 minutes off and then 7 minutes on seven minutes off. (Dr. Clark had rests of 20 minutes, but i got that wrong and it still worked.) One person was in the hospital with the bleeding kind of Dengue and after using the zapper was discharged the next day.